Today’s “Card of the Day” features a new Gear Chronicle Legion with an old mate! 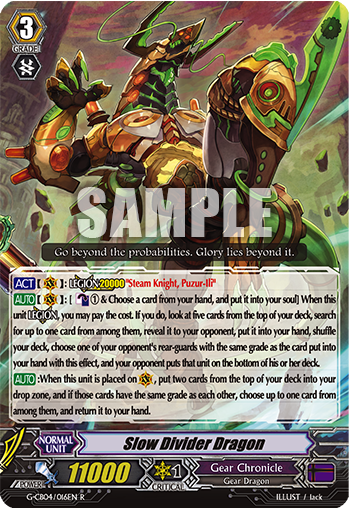 [AUTO](VC):[Counter-Blast 1 & Choose a card from your hand, and put it into your soul] When this unit [Legion], you may pay the cost. If you do, look at five cards from the top of your deck, search for up to one card amount them, reveal it to your opponent, put it into your hand, shuffle your deck, choose one of your opponent’s rear-guards with the same grade as the card put into your hand with this effect, and your opponent puts that unit on the bottom of his or her deck. [AUTO]:When this unit is placed on (VC), put two cards from the top of your deck into your drop zone, and if those cards have the same grade as each other, choose up to one card from amount them, and return it to your hand.